Club Penguin Cheats by Mimo777 Club Penguin Cheats by Mimo777: Club Penguin Protobot Retreating! 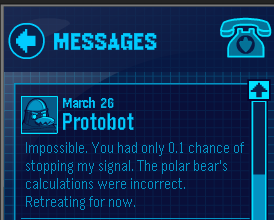 Club Penguin has sent us a new message from Protobot! Sounds great! Let's hope the last System Defender level will be out soon! it took me 5 times todo it! I FOUND ROOKIE ON YETI AT THE NIGHT CLUB!!! !